I got this skirt over a year ago and I feel like it's a quintessential "fall" skirt. It has beiges and other dark colors and is easy to layer. The brand is Heart of Haute. Honestly, I only own two skirts by them (no dresses or tops yet) and I can't tell how in love with them I am. I LOVE their prints but unless you get something on sale, I feel as though they're a little overpriced. I also have experienced some sizing issues. According to their website's sizing chart, I should be a size small, and I own their skirts in that size. But the waist is kind of big. Plus, the fit (maybe combined with that fact that it runs large) is slightly unflattering. There were a few photos that I did not use because the fit clearly looked awkward. I've mostly worn this skirt with cardigans so that's largely hidden the weird fit in the waist. This was one of the first times that I didn't and that I had an array of photos to examine just how the skirt looks from all angles, sans cardigans etc. There are fixes to this though! I've been meaning to invest in larger width belts to cinch my waist while wearing high waisted skirts and add some character and flare (plus potential color) to my outfits. And, I have cardigans in the meantime ;) And please don't misunderstand; I really do love this skirt! I'm just being honest about sizing and whatnot. I love how my Old Navy shirt matches my wedges from Two Lips (found them at a Plato's Closet) perfectly. I decided to mix prints here stripes against the Parisian backdrop while tying it all together with matching stripes. Even my Forever 21 heart shaped glasses are a loose match for this. I'm a sucker for anything Paris themed. Paris is the most elegant city ever, right? So any personification of that on prints makes me like a moth to a flame. Speaking of, this is one of the outfits I chose not to post last week in all the Paris tragedy. It felt insensitive to capitalize on that when it was a coincidence that I was intending to post this last week, and another outfit with a French motif. And good for you guys for calling me out a little in the comments of my post right after the Paris shooting about how the media covered this massacre more than some shootings in other countries as of recently! I usually totally know better, but I had a knee jerk reaction to the Paris shooting. But you guys were 100% right to say something; all countries experience tragedies and sometimes the media has a bias towards certain regions, but that doesn't make other places chopped liver! Like I said, I did "know better", but I appreciate the apparently needed reminder! And since we're on the subject...Friday brought us another shooting here in Colorado. Colorado is a place I generally feel really safe in, but sometimes the way we make national to international headlines frighten me. It's such a small area of the world, but there's so many shootings. Countless school shootings are the most obvious that come to mind, including one that became the most unfortunate poster child of "catch phrases" involving school shootings (Columbine). And of course the Aurora movie theater trial recently ended, which is another infamous massacre in Colorado. Other weird things have happened here and shooting sprees are more frequent than I'd like to admit. I was with a friend on Friday and I saw the push notification on my phone, and said, "Omg, there was another shooting here. This time it was in the Springs and apparently at a Planned Parenthood." My friend was as shocked as I was, but honestly, we were a little unfazed too because Colorado making at least CNN (if not world wide media outlets) for a shooting spree is not exactly a new phenomenon (and I've only been here since 2007). That was a really depressing thing to type just now. Just because this happened in my back yard doesn't make it more or less important than any other shootings. Every life has value, as I talked about here. As I am drafting this portion of this blog post, I am unaware of any findings that the shooter was making a political statement towards Planned Parenthood or if he was just on a shooting rampage that happened to overlap a Planned Parenthood parking lot. There seems to be some rumors going around, but so far I don't believe his true motives have been leaked to the public. I won't get super political, but whether he had a political agenda or was just plain old crazy it's a good time to state that I do not understand when people kill in the name of getting people to see things their way. While it's entirely possible he was just crazy and the Planned Parenthood location was a coincidence, the only silver lining is that because it happened on a Planned Parenthood property it opens up a dialogue. At the end of the day, so few people change their minds about what they believe about life. But if we can have more people seeing how awful it is when people shoot other people in the name of their beliefs--again, even if it's just a rumor that he even had that motive--hopefully that'll curb some violence against people who believe, think, and act differently than their neighbors. Maybe that's a far fetched dream, but I hate it when people kill in general, and I hate it when they do so as a form of a statement. The idea that even if under false pretenses a dialogue gets opened about that, then maybe the world can snowball into a slowly but surely better place. Like, that dialogue will inspire more people to live in peace amongst difference they'll never see eye to eye on. Who knows. But that's how I deal with these kinds of things. And if nothing else, I wish we could have more educated conversations about mental illness. This guy clearly had issues either or, but until we figure out how to help people in more effective ways, these shootings are going to keep happening by people who needed medical and psychiatric intervention. That's another dialogue we need to have more often. For the name of this blog post, I drew inspiration from a French titled song by Le Tigre, "Tres Bien." The song itself is in English, but within the chorus "tres bien" gets mentioned a lot. Le Tigre is a band I used to listen to quite a bit 7 or 8 years ago, but they fell off my radar a few years back. Lately I've been listening to them a little bit more because they're so fun. Gorgeous! Love that midi skirt. It's brutal to see what goes on in the world and at times in our own backyards but a conversation that indeed needs to be opened up to understand why? and how can we help to prevent such things. The print on your skirt is so pretty Lauren, I can totally see you skipping around in it! Love the print on this skirt! Anything Parisian gets me as well. Its so saddening to keep hearing about these shootings. Ill never understand why people do this. You are so stylish. This outfit is absolutely darling! I love your skirt. Nice print. Love the print on that skirt! It looks great with stripes! Love your top and shoes together with this skirt! You look great! I like wearing midi skirts in the fall too. I think you look gorgeous Lauren! 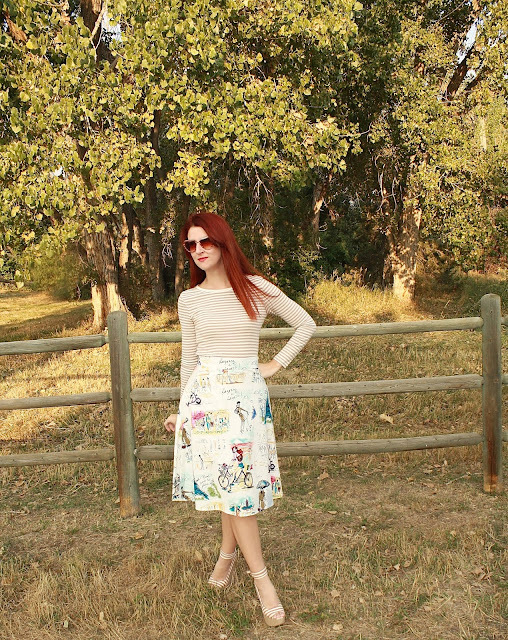 I love the retro print of that skirt with beige stripes! Perfect outfit! I love the print on that skirt, it's so unique. Beautiful outfit! Love a piece that tells a story. The scene is so cute, so Persian. You look adorable. Amazing Mix & Match, great job Lauren! 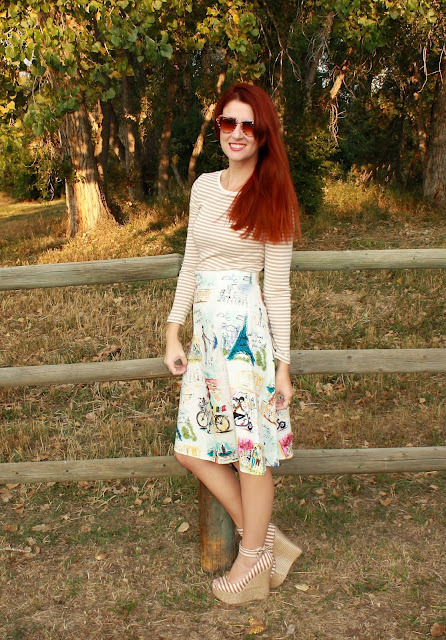 Totally obsessed with the print of your skirt!!! Any killing, what ever the reasons may be, is horrible and leaves people broken. I agree, maybe there can grow good out of the tragedy, but I feel like we live in sad times to wake up to these news every day. I love an good honest review! It's really helpful to ACTUALLY know how great/not great the sizing or quality of a piece is. I agree--the print on this piece is stellar. It's too bad that the fit is off. You can't tell from these photos! Love this outfit, that skirt is so cute and goes really well with the striped top! Thank you! They were a lucky second hand find! Super lovely look :) You look beautiful! These happenings around the world are awful, but all we can do is try to stay positive throughout it. I love the print on your skirt! Great post. Dear Lauren Blair, I am so happy for your support during the last weeks - I felt so lethargic, couldn't read much. And thank you too for Le Tigre - I loved it, didn't know about it! French themed prints are so cool - by the way, I also loved how your Old Navy top matches your shoes! And I am sorry about the shooting in Colorado. You are very right, every life is important and not more or less important than no one else. You are so right and I wish many more people thought this way! I really love how you styled this skirt with a striped top in a muted tone. It goes perfectly, especially with the shoes. And I love the Paris theme! I really appreciate your thoughtful posts and that you appreciate the feedback. I mentioned the other tragedies but I wasn't trying to blame you at all. It's more of an societal issue than it is any one persons fault. OMG how cute that your shoes match your top exactly! And I love Heart of Haute. I love their dresses, skirts, tops, and cardigans! I've never seen this skirt before! It is so cute!